Charlotte Brontë was born in Thornton in Yorkshire, England, on April 21, 1816, the third of Patrick Brontë and Maria Branwell's six children. Her father was an Anglican minister who moved the family to Haworth, also in Yorkshire, in 1820 after finding work at a church there. 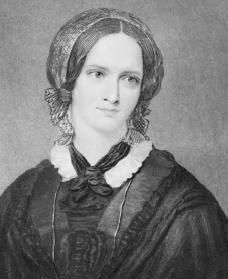 Except for a brief and unhappy period when she attended a religious school—later described in the opening chapters of Jane Eyre —most of Charlotte's early education was provided at home by her father. After the early death of her mother, followed by the passing of her two older sisters, Brontë, now nine years old, lived in isolation with her father, aunt, sisters Anne and Emily, and brother Patrick Branwell. With their father not communicating much with them, and having no real contact with the outside world, the children spent their time reading and creating their own imaginary worlds. They recorded the events occurring in these imaginary worlds in miniature writing on tiny sheets of paper. Anne and Emily made up a kingdom called Gondal, while Charlotte and Patrick created the realm of Angria, which was ruled by the Duke of Zamorna. Zamorna's romantic conquests make up the greater part of Charlotte's contributions. He was a character who ruled by strength of will and feeling and easily conquered women—they recognized the evil in him but could not fight their attraction to him. The conflict between this dream world and her everyday life caused Brontë great suffering. Although her life was outwardly calm, she lived out the struggles of her made-up characters in her head. At age fifteen she began to work as a schoolteacher. She and both of her sisters later worked watching over the children of wealthy families. While attending a language school in Brussels, Belgium, in 1843 and 1844, she seems to have fallen in love with a married professor at the school, but she never fully admitted the fact to herself. After returning to Haworth in 1844, Charlotte Brontë became depressed. She was lonely and felt that she lacked the ability to do any creative work. She discovered that both of her sisters had been writing poetry, as she had. They decided to each write a novel and offer all of them together to publishers. Her sisters' novels were accepted for publication, but Charlotte's The Professor, based upon her Brussels experience, was rejected. (It was not published until after her death.) However, the publisher offered her friendly criticism and encouraged her to try again. behind the pseudonym (pen, or assumed, writing name) Currer Bell, but later she revealed that she was the author of the book. Of all Brontë's novels, Jane Eyre most clearly shows the traces of her earlier stories about the imaginary Angria in the character of Rochester, with his mysterious ways and shady past. However, the governess, Jane, who loves him, does not surrender to Rochester. Instead she struggles to maintain her dignity and a balance between the opposing forces of passion and her religious beliefs. During 1848 and 1849, within eight months of each other, Brontë's remaining two sisters and brother died. Despite her grief she managed to finish a new novel, Shirley (1849). It was set in her native Yorkshire during the Luddite industrial riots of 1812, when textile workers whose jobs had been taken over by machines banded together to destroy the machines. Shirley used social issues as a ground for a study of the bold and active heroine and a friend who represents someone with more traditional feminine qualities. In her last completed novel, Villette (1853), Brontë again turned to the Brussels affair, treating it now more directly. Despite her success as a writer, Charlotte Brontë continued to live a quiet life at home in Yorkshire. In 1854 she married Arthur Nicholls, a man who had once worked as an assistant to her father, but she died within a year of their marriage on March 31, 1855. Gaskell, Elizabeth. The Life of Charlotte Brontë. 2 vols. New York: D. Appleton, 1857. Gordon, Lyndall. Charlotte Brontë: A Passionate Life. London: Vintage, 1995. Moglen, Helene. Charlotte Brontë: The Self Conceived. New York: Norton, 1976. What facts do you know about Charlotte Bronte? Why are her books so popular?